Gingiber: gingiber on poppytalk calendar round up! really? Wow. I have been sooooo busy the past week I can barely keep up! Orders are flooding in (thank you Holiday Rush) my show is this weekend, and I am running our Semi-Annual Meeting at my day job. This equals quite a bit of madness MADNESS I tell you! But trust me, it is the good kind. Who could be sad when there is so much awesome stuff going on all around me? 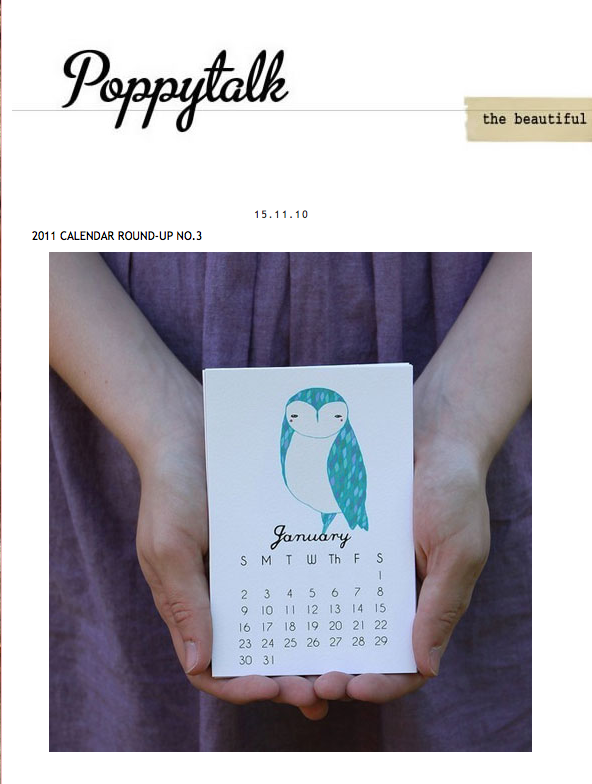 Anywho, My 2011 Calendar has been featured in a bunch of places recently (Decor8, PapernStitch, countless blogs) and now it is the main image for round 3 of the Poppytalk Calendar Roundup! I am so honored! Thanks so much to every person who has purchased a calendar. It has been my best selling item EVER and I am so tickled that it has had such positive reception! And as a special thank you to my blog readers: Anyone who makes a purchase between today and Sunday in the Gingiber Etsy Shop will get %20 percent off of their order (refunded via PayPal). To receive the discount, you MUST leave a message to seller saying that you are a GingiberSnap reader!